Applications are invited from suitably qualified candidates for admission into the Federal Polytechnic, Nekede HND Full time Programmes for the 2018/2019 academic session. 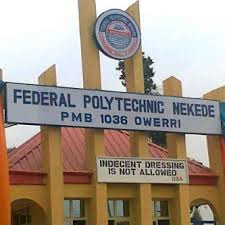 Read Also: How to Apply for Federal Poly Nekede Part-Time ND & HND Admission Form. For all issues, please mail: hndissues@fpno.edu.ng , ndissues@fpno.edu.ng or call 08087000802, 09055590766 for (HND).